We offer a comprehensive and innovative range of logistics management solutions powered by the cutting-edge technology and the latest market insights. We support logistics management and freight procurement teams within global manufacturers and retailers with market-leading ocean freight procurement and freight cost benchmarking solutions. This niche capability is delivered by our highly experienced supply chains practice team and is supported by proven methodologies, cutting-edge technology and some of the most comprehensive and robust information resources available in today's market. By combining up-to-the-moment market insights, with the latest technology and tailored advisory services we help logistics and ocean freight procurement teams realise cost saving, performance and productivity improvement. In short, our team has the industry experience and technical expertise to help you negotiate complex network optimisation, ocean freight tendering and provider management processes. If you're uncertain whether your tendering process is delivering results for your organisation, or if you're achieving the most favourable contract terms or competitive rates through the tendering process, or simply wonder if your carriers are delivering the levels of service you’re paying for - come and talk to us and we'll help put you in the picture. Ahead of the IMO 2020 low sulphur regulatory change, Drewry has begun providing members of its Benchmarking Club service with quarterly benchmarks on contract Bunker Adjustment Factors (BAFs). 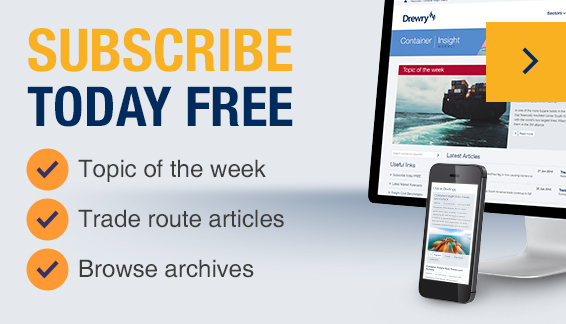 Drewry Benchmarking Club welcomes one of the world’s leading automotive and energy companies to its exclusive, online ocean freight cost comparison service. Our advisory assignments cover a broad spectrum of commercial issues – from freight rate benchmarking and ocean freight procurement support to network analysis, planning and supply chain optimisation. Our ability to field multi-disciplinary expertise and experience enables us to effectively address your specific commercial requirements, either working alongside client personnel or remotely. Ansell selected Drewry’s e-Sourcing Ocean Freight Solution (eSOFS™) to manage its ocean freight procurement event and advise on the direct carrier transition. The world’s first and only global source of container spot market freight rates on all the major routes. An essential reference for importers, exporters, freight forwarders and other industry stakeholders requiring up-to-date and independently researched container shipping cost benchmarks.